Sarah Olivieri joins this session to talk all about strategy. How do you create a strategy everyone is on board with and can follow? And, more importantly, how do you even define strategy? Sarah, founder of PivotGround, and Beth explore the link between strategy and capacity, what differentiates strategies from tactics, and Sarah’s “secret sauce” to help businesses thrive. She shares tricks for getting time back in your day so you can shift your focus to the activity that is most important, tools for staying on track with the strategy you develop, and more. When it comes to innovation and experimentation, ideas are only half of the challenge. Donna Kastner, founder of Retirepreneur, joins this week’s session to explore the other half: implementation. She and Beth delve into experimentation and how to get from a conversation about an idea to an actual product. Donna explains how to design a conversation that puts everyone on a level playing field and leads to exploring the "why" behind the idea—without jumping to tactics too quickly. She and Beth discuss how a hackathon can create an impact anywhere from a conference to just within your organization and bring people together to solve, or "hack," a problem, the importance of patience, and much more. Jeremiah Lane knows the power of putting a face to the name of an organization. After attending a conference, he came back to the Children's Hospital Foundation, where he serves as Communications Director, with an idea that changed how the organization approached its storytelling. With one campaign that directly involves the families they serve, the Foundation has been able to tap into the emotional side of the work they do and share those stories with their audience in ways that resonate, especially because they may be stories about kids from their hometown. Jeremiah shares how to use personal stories to create connections with donors, the link between development and communications, and more. As many organizations can relate, Julia Toepfer knows that it can be hard to generate the amount of content needed to tell your story when you have a small team. Julia, marketing and online engagement manager at National Immigrant Justice Center, joins this session to share how NIJC found inspiration for content from an unexpected source: its own staff. Julia shares how she and her team encourage staff members to contribute to telling NIJC's stories in ways they're comfortable with, whether it's writing a post, making a video, or even being featured in the story themselves. They explore maintaining messaging for staff members who are not in marketing, how to avoid hurting feelings or egos in new situations, and more. Say you have a great event that brings in big numbers of participants and donations to your organization. What should you do when the event is over to encourage guests and donors who may have given only to support a certain participant to continue giving to your organization? Kimberly Kroll-Goodwin, manager of events at STARS Air Ambulance in Saskatchewan, Canada, joins this session to share how her organization created a welcome series that introduced donors to the work STARS does and how they can get involved—without making a single ask. She and Beth explore how to measure where your donors come from, how to effectively tell your story to a new audience, and more. Segmenting your messaging isn’t a new concept—but there are new ways to do it without relying on just demographics. To Amanda Parsons, Associations Coordinator for the Oregon Recreation and Park Association, participation is a spectrum, and that translates to your email messaging as well. She joins this session to talk about how to use indicators of participation as a means of sending the messages people really want to receive without clogging their inboxes. She and Beth explore the value of segmenting based on interest level, how to effectively give your email database a cleanse and create a "healthy list," the lead indicators of an unhealthy list, and more. Even for an organization as big as the Red Cross, having a team of volunteers with a wide set of skills can make a huge difference — especially today in digital communications and social media. Sara Falconer, director of digital communications at Canadian Red Cross, joins this session to talk about how the organization created a system that allows volunteers to lead the charge in the next wave of social media ambassadors, and how they ensure volunteers feel like they’re making a real difference. She and Beth explore the merits of a shared editorial calendar, encouraging experimentation with a new program, and more. What's the secret to creating a killer email list? Believe it or not: The unsubscribe button. Gregg Banse, Director of Marketing and Business Development at the Lake Champlain Maritime Museum, joins this session to explore why quality is greater than quantity when it comes to your email lists, and why having people unsubscribe can actually lead to better results—and better relationships. He and Beth explore the value of automation, why opens aren't enough, how to understand email conversions, and much more. What does content mean today? Jackie Lalley, co-founder of Yodelpop, joins this session to talk all things digital communications and content marketing. She and Beth explore the differences between keywords and core topics, and how they relate to the concepts of pillar pages and topic clusters. She explains how using blogs and tracking searches can help you better understand what language works and what doesn't. They talk about how to choose the right words for a topic cluster, why it's not all about traffic, and much more. Janni Snider can always find something humorous in a situation. It's this sense of humor she brings to her role as Director of Creative Strategy for the United Methodist Communications that has led the organization to such campaigns as its HulaPalooza, which incorporated hula hooping to promote its global health initiative—and it's as fun as it sounds. She joins this session to explore the role of humor in engagement and how it can be successful for communications when used effectively, and much more. There's been a lot of focus on millennials—whether it's about avocado toast or how best to attract them to the work your nonprofit does. But there's another generation Aria Finger wants you to keep in mind: Generation Z. Aria, CEO of DoSomething.org, joins this session to highlight Gen Z and the work her organization does to serve this increasingly engaged demographic. She and Beth explore how to encourage participation and action from this group of 13- to 25-year-olds in ways that appeal to their interests, whether it’s politics or social justice; why it’s dangerous to think of all young people as the same; and more. Re-branding is a term that comes up a lot—but what does it really mean? Amanda Willard joins this session to share her experience with re-branding at Lincoln Park Zoo and why it’s actually about what she calls change management. A re-brand done right resonates not just externally, but internally as well. She and Beth explore the difference between participation and engagement, how to know when a re-brand is completed successfully, and much more. The face of fishing and other outdoor water sports has long been typically associated with that of a man. Rachel Piacenza and Kendra Lee from the Recreational Boating and Fishing Foundation join this session to talk about Take Me Fishing, which is run by the Foundation, and its new marketing campaign that strives to put the focus on women in fishing. They share the research tactics they used to discover the typical audience for fishing isn't what it may seem, how they focused their campaign on a new demographic, and much more. Amelia Kohm, founder of Data Viz for Nonprofits, joins this session to dig into data and visualization. How does data visualization make a difference? Is an infographic the same as data visualization? She explains how a simple chart or graph can tell a story and why some forms of visualization translate better than others. She and Beth explore how to know what type of data visualization to use to communicate the idea you're trying to share, how data can be better used to improve an organization, and more. Trying new things can be scary—but often, the payoff is worth it. Jesse Lane of Pure Charity joins this session to explore ways nonprofits can be more innovative and how to create an environment that fosters creativity. He shares how at an organization he was a part of, they would set aside four hours every week just to brainstorm new ideas or work on implementing ones already in the pipeline. It created an environment for innovative ideas to be brought to the table in a new way and people were excited to share their suggestions. He and Beth explore why failure isn't always bad, how to get your donors involved in organizational changes, and much more. DP 183: Does Your Marketing Equal A Big Pile of Tactics? Do you know the difference between marketing strategy and marketing tactics? Erin Dunkel of RPM Communications joins this week's session to share her view and how nonprofits can better organize their goals—and what they need to do to meet them. She shares the first three strategic steps people should take when it comes to their current marketing tactics, the data points marketers can follow when it comes to developing strategies and tasks, and much more. If your employees aren't ambassadors for your organization, how do you expect others to be? Mia Freis Quinn, vice president of communication Plastic Industry Association, joins this session to explore how to empower employees to be the champions of your cause. She and Beth discuss the organization's new microsite, how to use analytics to find out the answers your constituents are really searching for, how shareable graphics can make a huge difference for both employees and the public, and much more. When you're in charge of doing just about everything related to communications and marketing for your organization, it may be easy to feel overwhelmed—but not if you can figure out a way to make it work for you and the organization. Stephen Barker wears a lot of hats in his roles as director of marketing communications at Marillac St. Vincent Family Services and communications co-chair of YNPN Chicago. He joins in to share his advice on how to stay organized when your to-do list feels like it's overflowing as well as what a nonprofit marketer needs today to be able to do an effective job, and much more. Love it or hate it, technology has made a big impact on communication and relationships. Mark Mehling joins in this session to share his take on whether or not technology has made a positive impact. To him, technology and social media have been "killing relationships," but there are ways to fix that. He and Beth explore how nonprofits can use technology better, segmenting strategies that will yield better results and stronger relationships, what he calls "visual dissonance" and much more—including Star Wars. David Rhode didn't set out with the intention of his organization, Pitch In For Baseball, to become known for its disaster relief efforts. However, the work they do in providing softball and baseball equipment to communities with kids in need hit a home run as the organization was founded right after Hurricane Katrina hit. David joins in this session to talk about how a sense of urgency can elevate the importance of an organization's mission and message, as well as attract a new audience. He and Beth discuss the organization's communications program, how Pitch In collaborates with larger organizations, and more. When your company undergoes a big change—a CEO transition, for example—there are ways to ease your staff, volunteers and supporters through it smoothly. Cassie Dennis, director of agency Monday Loves You, joined this session to share tips and tactics for organizations experiencing such a shift and how to best equip everyone involved for the new chapter. She and Beth discuss what can cause a CEO transition, creating an effective transition plan, the best and "least destructive" approaches to announcing such a big change, and much more. Empowering employees to be the best they can be reflects not just in their performance at work, but also in the way they present the work they do to the wider community. Tara Collins, director of communications and resource development for RUPCO, shares how RUPCO encourages its staff to become ambassadors for the organization. Through photos on social media and in e-newsletters, staff members are incentivized to connect with each other as well as their constituents to put a face to the organization—and have some fun. Tara shares tips and tactics to inspire employees to also become brand ambassadors. Is it possible to add personality to your emails? Nate Adams certainly thinks so. However, he notes, there are ways to do it effectively and still keep your messaging sounding authentic. Nate, chair of communications for Young Involved Philadelphia, joins Beth to explore adding voice and vibrancy to email communications, training the next generation of leaders, why email is still valuable and ensuring your messaging appeals to the right audience while also relaying information. When you're in charge of getting the word out about a global event, what should be your first steps? What tools should you use? Lizanne Pando served as director of communications for the 2015 World Meeting of Families during the papal visit in Philadelphia, and she joins in to discuss the role of social media in the endeavor. She and Beth explore how public relations and social media intersect, how to include more than one language in your communications, and much more. This week, author Dorie Clark joins Driving Participation to talk about personal branding—on an individual level as well as for an organization. How does a leader's personal brand align with the impression of an organization as a whole? Can they be separated? Dorie and Beth dig into what personal branding actually means, how it can impact your reputation, and how—or if—your personal brand changes as you choose different career paths throughout your life. Julia Campbell has two pillars to her content strategy, which she divulges to Beth on this session of Driving Participation. Julia, an author and nonprofit consultant, joins in to talk about the elements that make up a sustainable content strategy and how social media plays into it all. She shares the three things that you should be using your digital marketing for, how social media has "revolutionized" human communication, how to post more provocative content beyond just news and announcements, and much more. Monica Montgomery wants to help liberate organizations from what she sees as limited thinking, which could be caused by any number of things. She should know a thing or two about creative thinking as the founding director of the Museum of Impact, which is a social justice museum that is completely mobile. She joins Beth to talk about the mentality of scarcity and how that translates to limitations in thinking, as well as how to create "irresistible" experiences for your audience and why you shouldn't be afraid to use the word "agenda." DP 171: Congratulations on becoming a nonprofit communications director! Now what? When RoiAnn Phillips became the communications director for HealthConnect One, a newly created position, she had some questions to work out. Namely, what will that mean for the organization? What value will this role bring? She joins Beth to discuss her new position and how she got there, even with an unconventional background as a theater major. They explore the questions you should be asking yourself about your organization, misconceptions about what marketing means, and more. Using a donor's first name on a donation receipt. Making the "donate" big and easy to find. These seemingly small changes can make a big difference in not just improving your organization's donor conversion rate but also the donor’s experience of giving to your cause. Abby Jarvis, contact director at Qgiv, joins this session to explore the small changes that lead to big results when it comes to donation pages. From website color schemes to the donation page itself, Abby shares how you can make the experience as simple and meaningful as possible for a potential donor. How do you go about planning a virtual conference? Arianna Rehak brought together speakers and professionals for Surge, an entirely virtual summit spread over the course of a few days, that allowed attendees the chance to join in on educational sessions about topics they care about—without having to go anywhere. From the technology behind the summit (like prerecorded video sessions) to how she measured its success (such as feedback forms), she talks about the logistics of creating a free virtual summit and why the event goes beyond just being a list builder. Are you using LinkedIn to its fullest? Mike Kirby, vice president of business partnerships at Within3, joins in to talk about how to use LinkedIn to its full potential. From advice about targeting potential connections and leveraging your contacts, Michael shares his favorite approaches to communicating on the social platform and the messaging that works. He and Beth explore the steps to take when making a LinkedIn connection, how to use LinkedIn for research and much more. The concept of peer-to-peer is nothing new, but it has certainly changed over the years with the advent of technology. Dorene Ocamb, senior director of integrated marketing at MADD, joins this session to explore what peer-to-peer really is (it's simpler than you think) and how technology has offered new ways for constituents to engage with your organization and spread your mission. She describes what she sees as a "renaissance of participation" and how younger generations are changing the peer-to-peer game. DP 165: What Tools and Tactics Are You Letting Go? As we head into 2018, Beth wanted to know: What tactics or strategies are you letting go of? She gathered responses from past Driving Participation guests. From foregoing massive website launches to leaving phonathons in the past to changing up social media habits—maybe even letting go of Facebook altogether—listen in to hear what some in the community are leaving behind in the new year. Mike Lenda has experience in both the for profit and nonprofit world through working previously in marketing at Starbucks and now mobilization at Compassion International. He joins in this week to share some practices he learned at Starbucks and how they could—and should—be applied to nonprofits. From staying true to your mission—know your story and know your why, Mike says—to making your audience feel like partners in your organization, Mike shares what Starbucks has learned that nonprofits can learn, too. On the outside, Philadelphia's 30th Street Station is just a big train station. But for Sarah Davis, director of development for the city's University City District, it represents a connection to lifelong employment and exit from poverty in some cases, or the home of outdoor space The Porch, where West Philadelphians can connect over lunch from the food truck on-site. She joins this session to talk about how the 20-year-old organization revitalized an area of the city and the conversations the organization has held with their audience to find out what the University City District means to them. Some organizations suffer from failure to see things as the donors themselves see it, notes Nick Ellinger on this week's session. Nick, vice president of marketing strategy for DonorVoice, joins in to talk about how to create a connection between development and communications, and why communications in nonprofits is often one-sided. He explains how you can get real, substantive feedback from donors—and then how to actually use it. Where can you improve in your messaging so donors feel a personal connection? He shares some key advice, such as be careful what you ask as well as how you ask. Jill Knaggs knows the perception about manufacturing typically evokes a sort of dingy image. But she also knows the industry is anything but dingy. She joins this session to talk about a campaign she coordinated as communication and marketing manager for the Canadian Manufacturers and Exporters Association of Manitoba to change perception and show people what the industry is — and how they already interact with it, from food processors to aerospace. She explains how the organization incorporated hijack marketing around Canada's 150th birthday celebration and employing external influencers to reach a new and potential audience who can become advocates for your cause. As Jen Martindale will say, having a brand strategy in place just the starting line—not the finish line. She helped the Yerba Buena Center for the Arts undergo a total rebranding, which doesn't mean a new logo. As Chief of Marketing, she helped the organization reach a new audience in a way that worked for them and created an image and strategy that communicates who the YBCA is. She talks to Beth about the role arts and culture play in enacting change, why you should never try to replicate what another organization does, how to create trust when you're taking a big risk, and more. Will Dennis wants people in leadership positions to come from a place of 'yes.' With a background in theater and improvisation, Will, manager of the Prep Fund at St. Joseph's Preparatory School, knows the notion of "yes" and taking a risk on an idea is paramount—and often pays off. He believes in the value of conversation in determining what drives people's participation with an organization and creating a real relationship. For those who want their organization to start taking more risks, he gives listeners who want start making a difference a two-part challenge and shares advice on how change starts from anywhere. This week, Beth is back with the team from Chemical Heritage Foundation. This time, she talks with Shelley Wilks Geehr, director of the Roy Eddleman Institute, about the roles of social media and digital content for the museum. Shelley explores the various media assets of the organization, from its quarterly print (yes, print!) magazine to a podcast to weekly Twitter takeovers. She also explains the role of Wikipedia in their organization and how it has helped attract attention to the museum. They talk about the museum decides what content they create, the benefits of social media, and more. When you start a new project—like a new exhibit at a museum—you might look at what other organizations are doing, and that can be a good thing. This session is all about collaboration—both internally and externally—as Elisabeth Berry Drago and Rebecca Ortenberg from the Chemical Heritage Foundation join in to talk about how the museum worked with other organizations as it developed its newest exhibit. They discuss how they worked to personalize the exhibit for museum-goers and how they looked to other organizations for help in creating that experience. It's easy to think of branding as something superficial. But at its core, a brand is really just a relationship, as Cynthia Round explains on this week's session. A brand creates an inherently emotional connection that inspires loyalty and ongoing action. Why does your audience connect with your organization? Asking qualitative questions that seek to answer how people identify with a brand helped Cynthia in her work at organizations like United Way Worldwide and the Metropolitan Museum of Art. She and Beth explore why brands are more important for nonprofits, why your audience matters and much more. Amanda Kaiser, qualitative member researcher with Smooth the Path, has done more than 300 interviews with members of associations to understand their worries, challenges, problems and experiences with the association to determine why they do or don't engage. In doing so, she's learned a few lessons and tips that she shares in this week's session. She explains why the new member process is upside down. Early experiences with your association—whether it's the first webinar, the first interaction with a staff person or the first conference they went to—leave a longer lasting impression on new members than you might think. Are you struggling to reach your audience through email? Spencer Brooks from Brooks Digital joins in this week to talk about how your emails can be of value to your subscribers. He talks about what it takes to get your emails into people's inboxes and how to avoid the spam filter. For those dealing with low click-rates and high unsubscribe rates, he provides tips on how to clean up your list so that you are getting the best results that you can. He and Beth explore combining social media with email, how to reach a large audience effectively and much more. Anika Rahman has worked with such organizations as Rainforest Alliance, the Ms. Foundation, and the United Nations Population Fund. She joins this session to talk about the different facets of leadership, from how leadership is different for men and women to how leaders should deal with failure. She talks about the true role of a leader when it comes to creating inspiration and—most importantly—trust. She and Beth explore the differences between a vision and a mission, how a leader can build trust, what "leadership" actually means, and much more. What makes a good leader? Sandy Rees jumps in this week to talk about getting into the mindset of being a good leader—especially if you don't see yourself as one at first. Leaders set the tone of the organization, and Sandy gives tips about how to buy into yourself as a leader. For those starting a new nonprofit, she talks about the importance of finding staff and volunteers who believe in the organization's mission as much as you do and are willing to put in the time and talent to get the organization off the ground. Breast cancer. Cáncer de mama. Cancer du sein. This week on Driving Participation, Beth is joined by Janine Guglielmino and Myriam Siftar from Living Beyond Breast Cancer (LBBC). They talk about a recent project they completed in which LBBC materials about breast cancer were translated into five other languages to better serve their audience and those who needed the information most. Guglielmino notes that this allows people to see themselves represented, which builds trust. They talk about communication guidelines, why a neutral message is not feasible, the difference between a regular translation project and doing a cultural assessment and more. So a donor made a gift... Now what? Gail Perry from Fired Up Fundraising joins in to talk about the post-donation experience. What kind of communication should you use for this donor? What should your message be? How do you invite the donor in and build an emotional connection? Gail answers these questions and more. She discusses different communications strategies, how to put the "fun" in fundraising events, why nonprofits shouldn't be afraid of email, the benefits of a print newsletter and much more. This week, consultant and speaker Hardy Smith joins in to share the best way to create not just a relationship, but a true collaboration. Real collaboration between people—or even between organizations—comes with many benefits. Collaboration helps vent out the issues at the root of a challenge and helps vent out the opportunities for creating solutions, he says. He shares where organizations go wrong with collaboration and the one element that makes a key difference. He and Beth explore internal and external collaboration and much more. In this week's episode, Theresa Miller, chief engagement officer for Girls on the Run International, joins Beth to talk toolkits: how to create them and why they're helpful. Theresa talks about how the fundraising teams and marketing and communications teams join together to engage different audiences and work as a unit, resulting in a fundraising increase on International Women's Day by more than 300 percent! With toolkits complete with social media messages, graphics, fundraising appeals and more—plus a calendar to guide when to post — Theresa explains how the organization helps its state councils and supporters reach their audience in a way that works for them. What is the difference between content and content marketing? How do you differentiate between an interim metric and what Beth calls a terminal metric? What about the difference between content and social media? Robert McGuire of McGuire Editorial Content Marketing Agency joins Driving Participation to answer these questions and more. He takes a deep dive into the world of content, particularly content-driven attraction and conversion. He and Beth explore micro conversions, lead magnets, and growth hacking among other terms and practices you can learn from to make your content strategy work. How can you create content that effectively drives your message home? Sarah Gilman, director of the National Resource Center on Lupus at the Lupus Foundation of America, joins in to talk all about content. From developing a consistent, recognizable voice to repurposing and repetition, she explores key ideas to keep in mind when it comes to creating content—especially health content. Content strategy isn't a term necessarily used often when it comes to public health, but Sarah talks about its importance in her field and in the work she does. She and Beth explore the importance of creating a content guide to help you implement a consistent voice and tone, ways to repurpose your content, and more. This week, Beth is taking what she's heard from podcast guests about the meaning of participation and turning it into concrete actions you can take. She outlines five shifts you can make on the path to participation. It's clear that participation can mean different things to different organizations, she says, but what everyone has in common in the need to inspire people to take the important actions you need for your organization to thrive. From creating a survey to get to know your audience better to making the simple change of swapping "we" for "you," Beth details ways you can get the right people to get involved. How can you optimize your experience with LinkedIn to really create meaningful and personal connections with people? Donald Hale, interim vice chancellor for advancement at the University of South Carolina Upstate and assistant vice president for development for the University of South Carolina Main Campus, joins in to talk about how to take a virtual connection and make it a personal one. When you send that first message to join a network, you can personalize it beyond the general introduction. Donald gives examples about how to use LinkedIn to network in the most optimal way, such as when organizing local events to get the attention of the alumni who it applies to most. They talk about the importance of visual elements, active versus passive engagement, and more. This week, Beth sits down with the team from the Drexel Fund, Drexel University's annual giving team. They talk about how they reach 133,000 alumni and how their methods have changed over the years to create more effective messaging depending on who they're trying to reach. One key tactic has been experimenting with segmented groups of their target audience to create more personalized messages with the incentive of donating and getting involved. Drawing inspiration from even something like a Rubik's cube, they talk about projects and ideas they have to make their appeals fun, engaging and personalized. Whether your first introduction to MailChimp was on Serial (remember Mail Kimp?) or you use it regularly for your organization, this week is all about taking a page from their book to learn how you can use visual elements in your marketing and communication—without veering off-brand. For everything from annual reports to public health messages, Beth shares tips on how to use visuals to share information and tell a compelling story that is in line with your organization's personality. Jeff DeCagna, executive advisor of Foresight First, joins in to talk with Beth about recognizing the duty of foresight and using it to build resilience. Of course, he doesn't mean predicting the future but rather the ability or the choice to look forward. He explains how embracing the idea of foresight can lead to building resilience and help manage risks. They explore the idea of emphasizing governing over governance and how to encourage the people you're working with to see governing as an active process. DeCagna also discusses the difference between being a volunteer and being a voluntary contributor, and much more. Reflect on Martin Luther King Jr.'s legacy and how it can inspire you to effect change in your own community this week on Driving Participation. How did the movement to get involved in community service in his honor begin? Beth takes a look at the holiday's history and the lessons you can learn from MLK Day for your own work. Revisit past episodes to hear how the work other Driving Participation guests do can inspire you, too! Learn the magic of Google this week with digital marketing consultant Claudia Pennington. She joins in to share the secrets to getting the right people to your website — and then staying there. From keywords to the structure of the site itself, Claudia and Beth explore the mindset of a searcher and what you can do to fill those needs. She names her top priorities when assessing a website as well as the two trends she thinks will color marketing communications for the next couple of years. Listen in for SEO secrets and more. It sounds like a simple question, but there isn't a simple answer: Why does membership matter? This week, Diane Ward, president of Membership Matters, joins in to share the ins and outs of membership programs, from data collection to evaluating who your members are. Within her work experience, she has learned how people "move in, move up and move out of membership programs." Members vote with their feet and wallets, she says, so she takes a look at why it's important to look beyond factors such as revenue and expense equations and focus on what members do for your organization. New Year always feels like a fresh start with a clean slate. It’s a great time to look both forward and back. Last year we did a show (ep. 85) about looking forward and setting your marketing resolutions for the year ahead. This year Beth invited our past guests to look back at what they did over the year that helped them grow. In this episode, learn what fifteen of our consultant and nonprofit guests did differently -- and really worked. Listen in and get inspired to set your own intentions for what’s next. This week, Beth shares some tips to start planning your communications ahead for next year as 2016 draws to a close. Now's the time to map out a communications strategy that will keep your audience engaged the whole year through, she says. In this episode, take a look at what your year can and should look like. Engaging your audience year-round requires communication, and for most people, that means email. Instead of worrying about sending too many emails, map out the peaks and valleys of your communication. Beth shares six ways to fill the valleys in your communication so that downtime doesn’t become dead time. Everyone has to start somewhere. That's what Dawn Owens learned when she moved down South to Cullman, Alabama, and started a nonprofit, the Link of Cullman County, after seeing a need for it in her new community. Through talking to one person who led her to more community connections, Dawn got the ball rolling for her organization and built the momentum needed to help it grow. Four years later, she joins Driving Participation to talk about how she got that momentum started and kept it sustained. She talks about a grant contest the Link entered and how she used Facebook Live to create interest and engagement around the project—even interest from those who hadn't had any interaction with the organization before. How do you teach an 800-year-old organization to use social media? This week on Driving Participation, Bill Skowronski, director of marketing for the Central Dominican Friars and founder of Constellation, joins in to talk about how he has helped an old organization see the benefits of using new media. For Skowronski, it comes down to strategy. Implementing a weekly video series, Skowronski has helped the Dominican Friars gain a larger following on social media and embrace tools they hadn't used before. He and Beth talk about creating content that appeals to a very specific audience and thinking about the services you offer in terms of what the world needs from your organization. Jeff Miles has used his background in sales and marketing to find new approaches in fundraising as development and marketing director of the Keystone Opportunity Center. He joins Beth to talk about how he has been able to target Keystone's core audience. Armed with that information, he has been able to share stories and statistics and create tailor-made campaigns that appeal directly to them. He shares how you can sharpen your focus on the audience that will care the most. They discuss creating "gateway points" for the community to get involved and more. Google Analytics may tell you you have an 80% bounce rate. Before you freak out, Yesenia Sotelo is here to assure you that's totally normal. She joins Driving Participation to discuss how Google Analytics works (and where statistics like an 80% bounce rate come from) and why it isn't something you should be afraid to learn how to use. She explains why using Google Analytics actually gives you more room to experiment and try new things as far as how you reach people—and then how to determine what worked or didn't work. She and Beth discuss the six terms Yesenia teaches about Google Analytics, how to use it for your email newsletters and more. When you give a donation to an organization that actually works in another continent, how can you be sure you're even making a difference? Candi Summers is here to tell you you are making a difference. She's seen it and she can show you, too. Through her work with Bestwa, donors are able to help feed children in Liberia and Candi has found ways to show donors that they really are making a difference—especially new donors. Through personalized, handwritten thank-you notes to shout outs on her Facebook page, she makes it a point to truly welcome new donors into the Bestwa family. In any kind of business, there will be changes as time goes on. Although as Barbara Trautlein and Beth discover, the more things change the more they stay the same. But Barbara has seen plenty of change and adaptation occur in her field. Sometimes the biggest change can be yourself. How can you identify your own leadership skills to make you an even more effective change leader? Barbara explains her three styles of leading change and how you can identify them. They also explore why people resist change—and why they shouldn't. Back when Beth and Donnie Brake first met, they talked about the possibility of a redesign for Brake's school Coram Deo Academy. Now, the redesign is done and the effects of the transition are starting to show. Brake, director of development at Coram Deo, discusses the change from being a website that purely provided information to a destination for prospective parents and students that makes them want to learn more and engage with the school. They explore how to create an effective website that will encourage action—not just provide information. Have you started thinking about your year-end giving campaign? If not, don't worry, Andrew Rothman from Blue State Digital joins in to share some tips as far as getting ready for year-end giving. By dividing up the year into four quarters, he breaks down what exactly you should be doing in each quarter to ensure a successful year-end giving campaign that optimizes all of your communications. Whether through email or direct mail, there are ways to connect with your donors (and potential new ones) in ways that truly speak to them. What's the word with WordPress? Andy Stitt from Deliberate Media Solutions joins in this week to talk about the popular content management system and how it's grown in the last few years. He and Beth explore how the site has evolved from a blogging platform to a tool nonprofits should consider for building their website. How do you know if it's the right platform for you? They discuss plugins, incorporating themes, and why with web, you should always assume something will go wrong (and how to be prepared when it does). Think conferences are always boring? Think again. Adrian Segar joins Driving Participation to talk about how he has revolutionized the concept of conferences to make them interesting and most importantly, engaging. With that, he and Beth also discuss the distinction and intersection between "participation" and "engagement." What is the difference? How are they connected? He explores how the rise of online content has changed the nature of events and why the "traditional meeting" has become obsolete. Transitions in any part of life can be hard—especially when you're undergoing transitions in a national organization with local chapters. Laura Marx, president and CEO of United Way of North Carolina, joins in this week to talk about the changes United Way has made and how its regional chapters around the country are affected. One challenge Marx has tackled since she started is working with her staff to identify the audience they’re trying to reach. She and Beth explore how United Way has spread its new message throughout the organization and where its focus has been in its branding efforts. Annual reports can seem like a boring or tedious task—but Marlene Oliveira is here to tell you that it definitely isn't. With a background in copywriting and communications consulting, Marlene has done her fair share of reports, and she shares a few tips and tricks to help you make annual reports meaningful and creative. She and Beth discuss the role of a "persona" and how it can serve as a reminder that there is a person you're trying to reach. Pamela Hawley has always wanted to make a difference in the world. When she founded UniversalGiving, it was one way to achieve her dreams and give others the opportunity to volunteer around the world. This week, Pamela joins Beth to talk about creating consistency when it comes to messaging about your organization. It’s important to keep pushing forward as far as communicating via different platforms, but you should also be able to maintain your brand and your identity in the process and she shares three tips to help. Vanessa Chase Lockshin knows a thing or two about storytelling. This week, she's back on Driving Participation to discuss how to use storytelling to really find your audience and connect in ways that are meaningful and impactful. She and Beth explore how to create the most effective way to communicate with your ideal audience and donor base that will get them excited, inspired and engaged. DP 121: Are You Living Your Brand? Branding. A word that you probably hear all the time but might not really understand. Connie McCaw joins in this week to how your brand translates into someone else’s experience. A brand isn't just a logo, it's a culture. Connie and Beth explore how to tell when your organization needs to work on its brand, what people get wrong most often in thinking about what branding means and more. What are the first steps you take to creating more sustainability for your organization? Where do people get stuck most when making themselves sustainable? Sandy Rees of Get Fully Funded joins in this week to answer that question and more. She explores creating long-lasting and meaningful relationships with your donors and gives a preview of her upcoming conference, the Inspired Fundraising Retreat. If you got a grant for marketing, what would you do first, and how would it make a difference in your capacity to do your work? That’s what Beth wants to know. In honor of her 50th birthday, she set out to get 50 responses from all different nonprofits and organizations to find out the answer. As the answers poured in, a theme emerged: a clear understanding among nonprofit marketers that you need both a strategy and execution. She explores how a grant would help in areas like branding, research and strategy, increasing awareness and much more. You probably use some form of social media, whether for personal use or for your organization. Janet Fouts joins the show to explore how mindfulness when it's applied to social media is different than just "doing" social media. Janet, CEO of Tatu Digital Marketing, talks about how just scheduling automated posts without followup engagement can sometimes be detrimental to really letting your followers get to know you as not just a brand but a person. They want to know they're dealing with a real human being. Janet reminds listeners there are ways to take a mindful approach to social media while still being efficient and practical. DP 117: The Trick to a Successful Annual Appeal: Start Now. This week, Kerri Karvetski of Company K Media joined Driving Participation to discuss newsjacking - the process of leveraging trending news to elevate your brand’s message. As a nonprofit organization, newsjacking is a quick and easy way to produce content that is customer-focused, while establishing credibility in your industry. When done well, it can result in a surge of traffic, while increasing engagement, brand awareness and recall. Few people would question the powerful impact of a strong, engaging brand within an organization. But how exactly do you implement an internal communication strategy that aligns your supporters and employees in support of your brand's promise? This week, Jennifer GoodSmith, Vice President of Marketing and Communications at The Morton Arboretum, joined Driving Participation to talk branding. Jennifer discusses building your brand from the inside out- focusing on internal as well as external branding. Do you know that your organization is special but struggle with communicating it in a way that attracts the support you need? Branding is a powerful tool that can change the trajectory of your organization. When done well, it can transform how you find and connect with your community. This week, Beth tackles the basics in building your foundation. If you have ever thought your organization needed branding but were not quite sure exactly how to get there, this episode is for you. How can organizations and nonprofits align their information to meet the needs of donors, volunteers and supporters? Understanding your audience is a fundamental key to success, whether you're seeking to attract, inspire, engage or motivate supporters to take an action. Successful messages anticipate and meet the audience's needs. This week, Greg Koch, Director of Education and Volunteer Services at Zoo Miami joined Beth, to discuss tailoring your organization's messages for success. One of the most effective ways to communicate your story and mission statement as a nonprofit, is through a blog. Blogs enable you to "tell the story" of your brand over and over again, connecting individuals to your cause and inspiring them to support your organization. This week, Laura Norvig, Digital strategist at ETR, joined Driving Participation to discuss how to build your brand through blogging. Great storytelling has the power to prompt action, while creating meaningful connections with donors, funders, and supporters. How can nonprofits develop a sustainable system for collecting and these sharing stories? This week, Lynn Fitch, Development Director at Growing Gardens joined Driving Participation to discuss best practices for nonprofit storytelling, and channels for distributing and re-purposing that content. At its best, marketing automation exists with the goal of growing your database and keeping your audience engaged. This software is designed to help you prioritize and execute your marketing tasks in a more streamlined and efficient way. Many organizations are starting to welcome email autoresponders and marketing automation systems to deliver highly-targeted, personalized messages. This week, Joe Moran, Chief Creative Officer at True Colors Fund joined Driving Participation to discuss the tricks and tools to start an automated marketing campaign. Thinking like a designer can transform the way organizations develop and approach products, services, and strategy. If you want to make your organization more innovative, creative and member-focused, it starts with a set of principles known as design thinking. Design thinking offers a structured framework that helps associations evaluate ideas and move projects forward. This week, Garth Jordan and Keith Chamberlain, Co-founders of RevvCrew, joined Driving Participation. Keith and Garth discuss how to improve internal organization and team culture through design thinking. While nearly all nonprofits engage in some form of online marketing, an increasing number are using social media to raise awareness and increase donor retention through online campaigns. When successful, these online campaigns provide an avenue to tell your story, engage with supporters and get results. This week, Debra Askanase, founder and digital strategist of Community Organizer 2.0 joined Driving Participation to explore what it takes to design and execute a successful online campaign. Stories are the basic building blocks for reaching our goals. They have the power to attract donors, win support and raise money. Yet effective storytelling is still one of the biggest challenges facing nonprofits and organizations. To better understand these challenges, Nation Hahn, Chief Growth Officer at EdNC, joined Beth to discuss the basics of storytelling, and how to implement stories that engage communities. To have a high-functioning organization, it is critical that all members, donors, volunteers, partners, and staff understand what value they provide a community and what change they exist to create. This week, David Rhode, Founder and the Executive Director of Pitch In For Baseball, joined Driving Participation to explore how to build a foundation for long-term success. Pitch In For Baseball, is an organization that works to provide baseball equipment to children around the world. As an executive director, it is critically important for David to mobilize and engage with volunteers, nonprofits, business and government agencies. Building awareness and support is essential to creating a culture of philanthropy at Pitch in for Baseball. It's no secret that the traditional website redesign process is broken. One of the biggest mistakes is jumping into execution before understanding the needs of your visitors, customers and prospects. This week, Margaux O'Malley joined Driving Participation to discuss implementing a customer-centric approach in the website redesign process. For Margaux, principal of Grand Junction Design, creating a valuable, optimized site starts with careful research, discussion and measurement. Beth and Margaux explore building a website that invites participation, as well as the top platforms for web redesign. Nonprofits, government agencies, schools and associations all seek to create a feeling of community that inspires action. If your organization can successfully build long-term relationships with volunteers, you have a higher chance of retaining members and keeping them involved. This week, Sarah Hemminger, joined Driving Participation to discuss volunteer engagement. Sara is CEO and co-founder of Thread, an organization committed to improving the academic advancement and personal growth of underperforming high school students. In the process, Thread weaves a social fabric, creating a community of students, university and community-based volunteers, and collaborators. To engage volunteers, it is necessary to understand their motivations. What are the underlying factors that drive individuals to dedicate their time, experience and skills? Understanding why people volunteer makes it easier to find supporters, organize their work, and recognize their contributions. This week, Tobi Johnson, Chief Engagement Officer at VolunteerPro, joined Driving Participation to explore what pushes individuals to get involved. Beth and Tobi discuss the volunteer journey, and what organizations can do inspire volunteers to continue serving. What if nonprofits had the same marketing, technology, HR and strategy resources as corporations? Taproot, a service that connects organizations with passionate, skilled volunteers through pro bono work, aims to do just that. Pro bono services enable organizations to drive social change with a connection of resources. When successful, these engagements build overall engagement, and open up channels for growth. This week, Alexandra Hallock, Senior Program Manager for the Taproot Foundation, joined Driving Participation to explore the relationship between an organization and its volunteers. Beth and Allie discuss the necessary components for a pro bono partnership, and what nonprofits can do to make the volunteer experience rewarding for all parties involved. With the emergence of social media, the environment around volunteering has become more dynamic. Social networks give organizations and nonprofits new opportunities to connect with volunteers. This technology is not only about helping volunteers with developed projects and initiatives, it's also opening up a conversation with those who have not previously engaged. This week, Karen Bantuveris, CEO of VolunteerSpot, joined Driving Participation to discuss how nonprofits can use social networks to identify and build relationships with potential volunteers..
With National Volunteer Week fast approaching (April 10-16th), we brought in Maggie Creps to discuss the challenges and opportunities in creating a unifying volunteer experience. As Manager of Volunteer Engagement at Medical Teams International, Maggie is directly involved in the volunteer journey, transforming the way MDI inspires, engages and motivates its members. In the past few years, social media has transformed the traditional donor-engagement process. Organizations and nonprofits leverage these communication tools with everything from online competitions to video campaigns—to find, influence and engage supporters. Social media platforms are inexpensive yet powerful ways to recognize donor behavior, but how can organizations redesign their outreach strategies to be more effective? Steven Shattuck, VP of Marketing at Bloomerang, joined Driving Participation to discuss donor stewardship strategies for social media. The way we access, learn and share information has exploded in the last decade. Anyone with the desire to widen their skill set can access the plethora of networking communities, online tutorials, and learning applicators available online. This expansion of education welcomes micro-credentialing, a digital token or "badge" that signifies accomplishments such as completion of a project, mastery of a skill, or mark of experience. This week, Sondra Smith, Director of Special Projects for EDUCAUSE joined Driving Participation to explore the use of micro-credentialing and education to engage with members. What's the difference between journalism and online content marketing? Both work together to deliver useful and engaging information that connects to members and generates leads. More and more organizations are realizing the value of high-value content, and are hiring journalists to produce it. This week, Julie Shoop joined Driving Participation to discuss the gradual convergence of marketing and journalism. Julie is Vice President and Editor in Chief of Associations Now Magazine, a subset of ASAE, which works to provide resources, education, ideas, and advocacy to enhance the power and performance within associations and nonprofit communities. The Mann Center of Performing Arts has served for many decades as the City of Philadelphia’s premier outdoor performing arts festival. This year, the Mann celebrates its 40th anniversary, and with it comes the launch of new initiatives tailored to reflect the expectations of 21st century audiences. As a nonprofit, the Mann Center is focused on fostering long-standing relationships with its audience, artists, donors, board and staff, volunteers, community and business partners, and other internal and external stakeholders. But how do you move someone from first time attendee to active participant within an organization? This week, Cathy Cahill, CEO, and Kelly Schempp, Vice President of Audience Development and Integrated Marketing joined Beth to discuss the strategy behind the Mann’s marketing and fundraising efforts. Donor recognition is essential to the long-term health of any organization. Every nonprofit wants to recognize donors in some way, shape or form, but what does it take build a relationship that leads to long-lasting support? This week, Karen Singer, artistic director of Karen Singer Tileworks joined Beth to discuss building a strategy around creative donor recognition. When properly executed, it is a highly valuable investment and fundraising tool that can be leveraged to help increase donor gifts, before, during and after campaigns. Email marketing is one of the most powerful tools available to nonprofit organizations, with its ability to connect with audiences, build support for causes, rally volunteers and increase donations. But what does it take to develop an email marketing plan that ensures your subscribers are engaged by your content? This week, Jeremy Koch, Chief Empowerment Officer at Empower Nonprofits joined Beth to discuss the opportunities available within e-mail marketing. What takes a good organization from inertia to innovation when it comes to creating behavior change among audiences? Brendon Shank thinks its about changing the expectations of the teams involved, empowering them to try new things and put their passion into it. In this episode, Shank talks about the Society of Hospital Medicine's Fight the Resistance campaign and how staff members brought their own innovation and enthusiasm to the table. LinkedIn has evolved tremendously over the last couple of years, transforming from a social network tool to an expansive platform for managing professional connections and branding. There are many opportunities on LinkedIn that enable organizations and nonprofits to effectively reach their targets: from developing a strong network of professionals to utilizing board members and discussions to increase participation. This week, Brynne Tillman, CEO of Social Sales Link joined Beth to discuss leveraging LinkedIn for business development and communication opportunities. One of the interesting things that is happening with mobile computing is it's changing the overall dynamic of how we consume the web. 73% of all mobile searches trigger follow-up actions, which means having a mobile-friendly site is more important than ever before. Mobile devices are quickly becoming the go-to for work and communication, changing how organizations deliver data and drive action. This week, mobile strategist, Chris Ferdinandi joined Beth to discuss how nonprofits can tailor communications for mobile viewing and increased interaction. Organizations are increasingly making the move to digital– transforming printed publications and annual reports into interactive online content that drives action. Video is well on its way to become the star of content marketing, with its shareability and mobile components. This week, Elin Barton, CEO of White Knight Productions joined Beth to discuss repurposing marketing materials to drive engagement and participation. What does it mean to collaborate, and what role does collaboration play in nonprofit management? This week, Denise Hayman-Loa, CEO of Carii joined Beth to discuss audience-focused creation within a network. Content marketing is a powerful way to spread your organization's message. By taking on a strategic approach to creating and distributing content, you can attract, educate and inspire your participants, all while increasing fundraising. This week, Claire Axelrad, of Clairfication joined the Driving Participation podcast to unveil how to utilize content marketing to master online social fundraising. It's no secret that volunteers are an essential part of all associations and nonprofits. They add value to your organization, bringing forth their ideas, energy and expertise. But what exactly does it take to keep volunteers? This week, Rob Wenger, CEO of Higher Logic joined the Driving Participation Podcast to explain the process of transforming volunteering into a rewarding member benefit. Rob analzyed volunteer best practices to find that recognition and access are the best ways to retain members for life. I hope you had a terrific year. Mine was very interesting with some great events, opportunities and challenges. I have a million ideas and things I want to accomplish in 2016 and it can be hard to stay focused--even for someone who teaches that. So I asked nonprofit marketers to share their resolutions for the new year. Are these on your list? Whenever an organization reevaluates itself or starts a new initiative, it can be confusing as to where and how to start. This week Meredith Low, joins us to examine the differences between strategic, tactical and operational resources within an organization. Meredith, an experienced management consultant at Meredith Low Consulting, works with organizations to understand how, when, and where to grow in the context of fast-changing environments. Meredith touches on the difference between tactical and strategic planning, and how both work in tandem for your organization. This week, Amie Simpson, Assistant Director at Temple University, joins us to share how her team was able to transform a national campaign to fit around Temple's needs, turning Giving Tuesday into Giving "TUesday." Amie focused on creating a sense of togetherness among Temple alumni by sparking an everyday conversation using simple, image-based content throughout different social media platforms. By doing so, she was able to tailor the campaign to drive engagement and increase participation among alumni. This week we hear another story of life after rebranding. The YMCA is a national brand with a decidedly local sense of independence. Rebranding when hundreds of organizations will deliver the message needs to be an inclusive project. Kate Coleman, EVP of Strategy shares the profound transformation that has occurred through defining their cause as a team. She says that building brand equity has become a multiplier for their efforts and shares the single best tactic to start with. Five years after rebranding, Tina Lauver, has learned that launching your brand is really only the beginning. As Marketing and PR Manager at the Dauphin County Library System, Tina has led the transition of the Library's image throughout the county. Over time, Tina has learned how to evolve and adjust to address the changing needs of the library, the staff and the patrons while maintaining the stength and purpose of the brand. With 78 shows under our belt we have a wealth of experience among our podcast guests. As #GivingTuesday approaches, Beth asked her past interviewees to share their plans and insights for this year. We have a terrific slate of examples, presentations, blog posts and more to help you jump in on this movement - even with just two weeks to go. The publisher of FundraisingUK, Howard Lake joins Beth today to share tips and tools for creating sharable images. Howard shares what kind of images are working today as well as his favorite free programs that make image creation easy for a non-designer. They talk about how to take pictures with social media in mind and the best ways to edit and customize images on mobile. The Nature Conservancy is a large organization with resources and partners that help them achieve a global mission. Managing Director Geof Rochester joins Beth today to show you how any organization can find the perfect partners. Ultimately, if you want to attract the right people you need to know who you are looking for. Geof and Beth talk about how to define the characteristics of your audience and how that helps you know who to look for in a partner as well as in a member or a donor. Have you figured out what makes your members say yes and want more? Understanding what motivates people and creates a community is Anna Caraveli's favorite subject. Many organizations treat their members like commodities rather than customers. Anna shares the qualities of an engaged organization and how letting your members determine who you are is the key to sustained success. How do you fit in everything - or should you even try? Network for Good VP of Communication and Content, Caryn Stein works with all kinds of organizations and sees their challenges with communications. Today she shares perspective on building a system that supports your efforts. Learn what to do, when to jump in and how to keep your goals realistic. You'd be surprised how many people are curious about particle physics. When Kathryn Jepsen started as the Editor-in-chief, Symmetry Magazine at SLAC National Accelerator Laboratory it was a print magazine suffering from budget cuts. In the process of going online, the publication has found a new audience and created opportunities to share this science with people they never expected. Learn what it takes to deliver content online in a way that not only keeps your current audience, but adds a new one. This week, Beth joined Pamela Grow for a Newsletter Review webinar as part of Pam's "The Basics and More" Newsleter course. Listen in as Beth and Pam analyse print and email newsletters and offer tips and suggestions. To see the newletters and follow along, go to the show notes at www.iriscreative.com/dp073 to download a copy. Its time to get serious about being specific. Today Beth is joined by KiKi L'Italien, moderator of the long-running #assnchat Twitterchat. As one of the strongest voices in member-focused communications, KiKi shares her experiences with building audiences by creating content they want. For online media alone, you need different size images for Facebook, Twitter, blogs, Instagram, LinkedIn, and other sites. Within these sites, different pieces of content need different size as well—and all this isn't even mentioning print! If you have a design team or budget this may not be a problem, but for many organizations, those resources aren't always there. This week, Maggie McGary of the Society of Fire Protection Engineers joins Beth to share her journey in finding the best design tools for non-designers. As we close in on the 4th #GivingTuesday, Sean King joins Beth to talk about using the event for more than a one day fundraiser. Sean brought together the arts organizations in Allentown, PA to create a bigger impact than any of them could have achieved on their own. He shares how collaboration can help improve visibility for arts and build excitement. GivingTuesday is gaining in recognition and there are more opportunities than ever for using it as a tipping point to grow. If humans have anything, it's opinions and if they would like to do anything, it's share those opinions with others. Are you listening? At NTEN, the Nonprofit Technology Network CEO Amy Sample Ward makes sure they are. When the community shares ideas through a survey, in defining a conference program and more, Amy and her staff not only make sure to use them, but to promote their community-led design. Listen to hear how NTEN creates a distinctive experience that so perfectly reflects its community's interests. Segway races anyone? Do you struggle with how to generate more revenue while staying true to your core mission? Organizations of all sizes have the same concerns, even the most visited art museum in the world, the Musee du Louvre. While on vacation in Paris, Beth stopped in for a tour with Private Events Manager Katia Blanchard Lapeyre. Along with a private look at the Mona Lisa, Beth got an Inside view on how the Louve is carefully adding private events and crowdfunding campaigns to grow revenue and engagement. Back in February 2015 Amanda Charney, Joan Ochi and Lauren Walinski delivered a fabulous presentation at the CASE District 2 conference. This team from Development Communications at the George Washington University joins Beth today to share the comprehensive campaign they developed for GW. With a logo, website, downloadable pitch sheets and more, the group developed a campaign brand perfectly aligned to the University's past and future and it's hitting all the right notes with their community. While many organizations have dropped print from their communications, the Nashville Rescue Mission did just the opposite. When Michelle Sanders Brinson took over as Communications Manager she had no nonprofit experience. With no sense of the "rules" Michelle went about creating a beautiful, interesting publication. It now breaks records every issue, generating more than 1.6 million in donations directly. Print publications so not have to be loss leaders. Listen in and let Michelle show you how its done. Rachel Hutchisson focuses on corporate social responsibility at Blackbaud and sees the intersection of nonprofit and for profits every day. When it comes to branding, Rachel talks about the idea that in nonprofits, you're paying it forward, investing in the future and making that donation out of the belief the good that will come from your contribution. Rachel and Beth talk about how opening up your brand to your community allows it to grow. To get what you really want, sometimes you have to pay for it. At DonorsForum, the state association for nonprofits in Illinois, Marlee Honcoop's team decided to colaborate to make their money go further. The Foundation members came together to fund a media buy to promote All Give Big, the state's GivingTuesday fundraising campaign. With a lot of hands helping it was an amazing success. In this episode Marlee tells all about how a unique idea likes this starts up and comes together - and how incredilby well it worked! So if you are a big, national organization with a budget, its easy to rebrand right? While at the Salvation Army, Jeff Stanger had the advantage of working with an agency on the rebranding and development of the "Do the Most Good" campaign. Lucky. But as an in-house leader of the implementation, Jeff saw firsthand that it takes more than a new Styleguide to execute a brand transition. Listen in as Jeff shares with Beth the challenges of getting marketing and development working together to deliver a consistent brand message. Would you love to bottle the energy of a live event and share it with your whole community? Rachel Coker of Binghamton University tells Beth how "live tweeting" will do that for you. To create the sponteneity of live takes a surprising amount of prep work. She gives tips on pre-scheduling, choosing the right tools, building your network, and strategies for "adding content to content" to get the most value out of an event. Email marketing is a great way to contact your constituents, but when it isn't done properly, you're wasting time and money. Heather Solos, director at email marketing company FeedBlitz, joins to talk about common mistakes fundraisers make when using email marketing. Sending emails through the wrong channels can make your messages end up in spam filters or not reach anyone at all. She discusses how to build a trusting bond with people on your email list, and how to use analytics and testing to target your messages efficiently. Today we're talking about the prep work you need to do when you're beginning to think about redesigning your website. Getting the website you want is more than just how it looks. You need to factor in your audience, what they want, how you will maintain it, what it connects to and how much you can spend. Beth invited Iris's developer, Liz Dobrinska to go talk about the things that can really make or break a website project. This episode helps you get prepared before you even think about contacting a web developer to redesign your site. Crowdfunding is growing as a way to finance projects, products, movies and ideas. The Canadian Society of Association Executives decided to try it as a funding experiment. Using Indegogo they raised over $10,000 in under a month. Michael Anderson, CEO of CSAE joins Beth to explain how the crowdfunding process works from planning, marketing, and operational angles. He makes the point that crowdfunding isn't collecting donations, it is getting an investment from people who want to see the benefit of your project. Want to match the effectiveness of direct mail with the trackability of the web? Steven Screen suggests you add a home-page takeover to your next campaign. Steven is the Co-Founder and Creative Director for the Better Fund Raising Company. Beth invited him to share the success clients have had with this tactic. End-of-year always comes up fast, so it's time to start planning now to create the biggest impact. Today we are accessing social media marketing more and more on mobile devices. Ritu Sharma CEO and Co-Founder of Social Media for Nonprofits joins Beth to share how mobile use is impacting more than just your website. If your social content is not mobile optimized, you're losing a lot of participation and interaction. It's time to get mobile thinking into all your digital communications. New for this season—we are talking tools. Designer Kelly Meissner swings by the Iris office to share options for photo editing. There are a million posts on "the 50 best" tools for everything, but in reality, every tool has strengths and limitations. In creating tutorials for Nonprofit Toolkit, Kelly tested some free and low cost tools for customizing your images and found which ones are best at the simple cropping, scaling and customizing you need to do daily. Listen in to learn what to use to get your images in shape. At universities everywhere, thousands of dollars ride on the effort of student callers. Having a pool of workers to call prospects can be a dream or a headache. It all comes down to leadership. James Hanks knows what it takes to keep a group of undergraduates showing up and giving it their all. As the Lead Manager of Mississippi State University Bulldog Calling Center, James shares what he’s learned during his rise from student caller to team leader. Imagine your favorite segment of a TV show. Whether it's particularly entertaining or informative, it keeps you coming back. Adrienne Frank, Managing Editor of American Magazine at American University, explains how anchor pages give the reader an expectation of what is to come. With 15 different types of anchor pages, they finding ways to enage alumni as readers - and as participants in the content. When talking about branding, it's easy to focus on familiar things like the logo. Australian brand expert Charlotte Prouse joins Beth to talk about where that can steer an organization wrong in the long term. By backing up and finding out who your ideal audience is and what motivates them you'll learn things you may not know before moving forward to execution. Listen in to hear how one koala sniffing dog completley changed the story for an Australian nonprofit. This week marks 52 episodes—a year of weekly shows! Beth looks back at the year and highlights the major trends that came out of more than 40 hours of conversations on participation. And she shares what she's learned from producing a weekly show. Listen in to see if the trends we are seeing are showing up in your organization. Think print publications are dead? Listen to Carol Meerschaert, of the Health Care Business Women's Association and you'll reconsider. Carol lets Beth in on the secrets to creating a publication that is central to the organization. A long-form magazine lets you speak to your members in a very personal way, to dig deeper into a topic and to have almost an intimate conversation with your members. Integrating it into your entire organization is critical. Carol shares how she creates content that her members love and look for. And the creative ways she has discovered to cover costs while expanding reach could be a game-changer for sustaining your publication. The press release is the dinosaur of the industry. Debbie Albert of Albert Communications says there's no question about it and if people keep referring to press releases, they really don't understand what public relations can do. Its time to talk PR. And Beth asked Debbie to share what's working today from traditional tactics to web and new media. Sarah Durham, Founder of Big Duck and Author of "Brandraising" joins Beth today to talk about what you can control—and what you can’t when it comes to creating perception. Back in the 90s even using the word 'branding' with a nonprofit could be a no-no. People saw branding as a very for profit sector concept. Now, organizations are really embracing branding concepts and seeing branding as much bigger than logo development. "New Hampshire Community Loan Fund" is a mouthful. No one wants to have to say it or type it 20 times a day. Before Steve Varnum arrived, the organization had shortened the name and—too late—discovered that they dropped the part that connected them to their audience. Today Beth and Steve talk about how to back up and correct a misstep with your brand. Online, participation means someone showing up to collect what they were promised. Brian Massey, the Conversion Scientist, weighs in this week on getting people to take action that moves your organization forward. Brian shares the incredible power that is available by watching what people actually do online. We talk about the role of design—and your designer—when it comes to guiding action. Online marketing, Brian says, is reducing the cost of knowing the truth about what people want. It may be science, but the results are truly magical. online world that is changing weekly. John thinks that the organizations that are making real progress online do a lot of risk taking. Facebook is a great forum for experiments because it lets your fans become ambassadors. Taking people that like you in real life and letting them share your story with their friends engages them and grows your community. Listen in to learn John's "recipes" for social engagement. This week Beth gets to turn the tables as Tony Martignetti from Nonprofit Radio gets to be a guest for a change. In over 225 episodes, Tony has had more than 500 conversations with nonprofit leaders and consultants on topics critical to the success of small to medium sized organizations. Beth asked Tony to share the lessons, trends and struggles that show up over and over among his many guests. Listen in and learn the top issues that cause roadblocks for hundreds of organizations hear Tony's ideas for getting past them. We all have this tendency to focus on bringing in new members and donors. That cost is rarely looked at against the value of keeping somebody in your organization. Shanon Doolittle, the Donor Happiness Coach, talks today about how a team approach to keeping your donors happy can make such a massive difference for organizations. Seven out of ten of our donors make one gift and never ever come back again. The biggest cause is that we don't actually stop, take the time to appreciate the gift that we've gotten and say thank you, tell donors what their gift did and then ask next after we've built a relationship. Lynne Wester, the Donor Relations Guru, shares her path for growing support through showing gratitude and impact. John Lepp's priority is to champion donors at every single turn. At Agents of Good, John focuses on the pure fundamentals of direct response and gratitude towards donor action. This week Beth gets to confer with a fellow designer on the role of marketing and the impact of design in donor communications. If branding is fundamentally about communicating what is truly distinctive, re-branding is about demonstrating change. This week Iris Creative client Beth Anne Miller, former COO and Director of Development for the Histiocytosis Association talks with Beth about the massive changes the organization was going through that made re-branding make sense. Beth Anne shares the inside scoop on what it took to convince the board, get funding, mobilize the staff and launch the new brand. What is the true purpose of your site? Is it to inform? To enroll volunteers? Inspire donations? Advocate? Web Developer Julie Friedman Bacchini from Neptune Moon joins Beth today to talk about the different goals of a website and how to focus the action you want people to take. Julie shares ideas for getting people to recognize themselves and know what to do when they get to your site. The Recording Academy is a professional association that you may better know as The Grammys. The big-time music award show is actually a product of a chapter-based national member association. With a huge televised production funding much of the organization's activity, the chapters have a unique opportunity to run without the primary focus being to keep the chapter alive. Today Beth speaks with Philadelphia Chapter Executive Director Mark Schulz about how the organization develops programing that aligns with its purpose. Your brand, your marketing, people's opinions of you certainly live in your community's hearts and minds. If you want to mirror that image, you've got to know how to connect with your people. This week Beth talks with Amanda Kaiser about the kind of questions you need to be asking today to grow for tomorrow. If you're wondering about positioning for the future and telling that story that people want to hear, surveys can't answer those questions. Listen in as Amanda shares her experience in what really works. Today Beth connects with Boston-based blogger and founder of Selfishgiving.com Joe Waters. Learn how struggling KMart can raise 22 million for St. Jude's Hospital in just months as Joe shares the most important factor of any register program. In fact, Joe is on a mission to help small and midsize nonprofits connect with small and midsize companies to form rewarding partnerships. Listen in to learn how other organizations found their perfect match and you can, too. New marketing methods, tools and tech seem to appear every day. This week, Beth looks back at resources that launched or added new features that were amazingly helpful in 2014. Nonprofits need to make the most of the marketing time available, so Beth gathered her favorites that save time and provided a huge return on the time spent. They are easy to use and free or low cost solutions to every day struggles. What tool helped you the most in 2014? The new year brings 365 fresh new days to play with. Kick off 2015 with a plan to constantly be learning. This week Beth shares her favorite podcasts, books and courses she used last year learn new things, inspire herself, set goals, and stay focused. Its a constant challenge to do the work of today while developing new projects. Use the early weeks of the year to keep pushing forward! And as a bonus - this week Beth launches a contest for listeners who write an iTunes review of the podcast. Win a Donor Love Toolkit, and if you share your biggest marketing frustration you'll also get a chance to win a book AND have your question featured on a show. Just write your review at bit.ly/DPpodcast and send it with the problem that plagues you on over to beth@iriscreative.com. Creating a compelling story is not easy, and Matt Hugg joins Beth this week to teach you how. You've identified what kind of story you want to tell, found the right subjects, scheduled the interviews...now what? Matt helps pinpoint where to begin and the process behind taking an interview and turning into compelling material from which your audience will truly benefit. The year is coming to an end, which means it’s the perfect time for you to make the most of your year-end campaign. Sandy Rees of Get Fully Funded joins Beth this week to talk about what you should be doing from today to Dec. 31 to really push your annual giving campaign. Sandy shares invaluable tips and ideas for the days leading up the end of the year, including emails, phone calls and social media. Content is much more than a blog, its really anything that you're trying to put out there to share your message. Organizations are finding that they need to become their own mini entertainment studio because it's not enough just to send out your end of year appeal for fundraising dollars. This week Beth talks to Michael Bellavia, CEO of Los Angeles, CA based HelpsGood about incorporating the art of entertainment into your content mix. There is a niche for every interest and if you can create interesting, engaging content people will seek it out in all forms. Finding money to do the work of your nonprofit is hard enough. Now try getting funds to market and communicate to grow your organization. Its not easy, especially if you don't know where to look. But Mandy Pearce does. Mandy is a grantwriter and owner of Fundraising for Good. She has secured millions of dollars in grant funding for organizations and helped craft plans that support funding for marketing infrastructure projects like websites to promotion for capital campaigns. Beth and Mandy talk about how to define your project and find the right funders so you can market like a pro. Detroit's economic challenges have made people more willing to change and try new things out of necessity. Targeting millenials as givers has been key in Tammy Zonker and Trent Thompson's efforts to grow a dynamic new donor base for The Children's Center. Beth talks with the team about creating attractive events and capitalizing on the social nature of young people to bring their friends along. In just three years, the 92Y has generated real, measurable action around an idea. With #GivingTuesday, they have created something more than an "event", they have launched a movement. And that's no easy task. As we head into its third year, Beth talks with Kait Sheridan, Director, Partnerships & Programs for 92Y about the enormous and fast growth of #GivingTuesday and what it takes to create this kind of impact. It's just two weeks until #GivingTuesday. Many of you probably have plans underway. And I bet there are plenty of you who feel like you just can't add in one more thing. #GivingTuesday has been so effective for so many I wanted to use this week's show to to give you ideas for things you still have time to do to launch or boost your campaign. It's surprising, the things a database guy knows about what's really connecting with your prospects and donors. In Beth's last conversation from the DonorPerfect conference, she snags Brad Fair, Donor Relations Support and Database Manager for the Mennonite Central Committee for a talk about the magic that's in the numbers. In a 100% volunteer run organization the risk of burnout is high. Especially when you are managing multiple large events including a knock out fashion show fundraiser. Martha Auld shares with Beth the secret to keeping everything running smoothly for nearly two decades. The volunteers have developed an amazingly mission-integrated event to raise money, cultivate new volunteers and actually deliver on their purpose. The show must go on, and Martha makes sure it happens without a hitch. Nothing like waking up to find your fundraising system frozen. Everyone dreams of content going viral. But are you prepared on the backend for when it does? Barry Martin of COTA takes some time to talk to Beth at the DonorPerfect user conference about what happened when an unexpected piece of media exploded overnight. Imagine having 10K in Google advertising and actually knowing what to do with it. This week I talk with Google Grants expert Stephanie Cockerel about what it takes to qualify for a grant and how to plan a campaignto make the most out of the gift. "Want to know the mystery behind what makes media go viral? Wish you could create it reliably? Join me as Justin Ware, Director of Interactive Communication at Bentz Whaley Flessner, shares the secret behind the repeated success he has with online viral marketing, consistently gaining reach, supporters and donations online." Over the course of a student's time on campus and in their early years after they graduate, Stephanie Fortunato of Neumann University makes sure students see the Alumni office giving first. At every chance, the Alumni, Annual Giving and Career Placement offfices work together to show students that they are part of Neumann forever. Beth and Stephanie talk about the high and low tech ways that Neumann reminds students that support is a two way street. If your fundraising plan is one dimensional, there isn't any place to move people to that would meet all their interests. Planned Giving is an attractive way for long time loyal donors to support their own interests and this week, Joe Tumolo of Gift Planning Development shows how simple it can really be. "If you're not offering plan giving to your donors,: Joe warns, "I promise somebody else is." It's often surprising how much more successful and profitable an organization can be going after what's exactly right for them, rather than trying to get a little bit of everything. Lisa Paris, Vice President of Marketing and Admissions at Peirce College talks with Beth about understanding the needs and desires of your customer for successful brand positioning. How do you create a new program that exceeds your wildest expectations without having a massive budget to launch and run it? This week Beth shares an on-site interview with the leadership and communications team from The Greater Philadelphia Cultural Alliance about jumping into teen programming for the first time. People underrate the power of their ability to really jump-start something in a community. It seems so big, but it doesn't have to be. Communicating with people in a way that resonates and gets them to take that next step and whatever action that may be is really the key. This week Beth talks with Abigail Quesinberry, Social Media Strategist with the Center for Teaching Quality in Carrboro, NC about collaborating to create social media content that builds your power-base. Online communities have come a long way with technology, but not that far with people because people just don't really change. This week, Beth talks with Cynthia D'Amour about how to create an online community that can sustain itself. Cynthia shares why communities die and what you can do to help a vibrant community grow. Barbara Kraus-Blackney, executive director of ADVIS, joins Beth this week to explore how to get people to show up and participate in person. They discuss the shift to online communications, how to capitalize on your website as a means of creating value for members as well as making choices in social media. Hear how Barbara's blend of communications gets high participation in programs. You say your place is like a zoo...and Bill Moore thinks you are right. Bill, President and CEO of the Zoological Society, talks with Beth this week about connecting people to the passion that is embedded in every organization. Come behind the scenes to see how the zoo creates a story that is deeper than animal exhibits. Learn more about Giving Tuesday, successful branding and the impact it could make for your organization with Jamie McDonald on this session. McDonald, chief giving officer of Network for Good, talks to Beth about the importance of getting organized now for a big campaign like Giving Tuesday and provides resources for the most effective plan. Beth has talked to alumni relations directors who help college students prepare for life as alumni and giving back to their university, but what about high school? This week, Beth is joined by Heather Durkin, director of alumni relations for Germantown Academy, a K-12 school. Heather talks about connecting with students and finding ways to help them continue giving back for years to come. Peggy Hoffman wants to get rid of volunteers. Well, she wants to get rid of the emotional baggage attached to the word “volunteer.” Instead, Hoffman, president of Mariner Management, looks at how we can eliminate the pressure of being a volunteer. They explore ways to engage members to become more active with the organization as involvement is the trigger to commitment. Beth is joined by Gloria Pugliese, director of Development from Delaware County SPCA, this week to talk about connections. Through direct contact as well as social media, the SPCA has been able to keep interest and participation high. Gloria talks about the benefits of putting a name to your cause (especially if it’s a puppy), and how that can rally donors into action. Beth speaks with Dana Heiman, vice president at the Brandywine Health Foundation, about how adding a personal touch (like a handwritten thank you note) can form an even stronger tie to your organization among volunteers and donors. Dana talks about the incorporation of community for a nonprofit, using her foundation as an example, and how that broadens the population of people your organization can help. Events are a great way to draw people in to see what your organization is all about, and to hold a successful event you need a strategy. Enter Gail Bower, president of Bower & Co. Consulting, who chats with Beth this week about how to create an effective strategy and start asking the right questions. Gail shares the three key pieces most important for audience engagement and where they come into play. This week, Beth sits down the alumni engagement department at Widener University to discuss all things communication. Beth is joined by Tina Phillips, executive director for alumni engagement, to talk with Tina and her team about how they can engage current students, the challenge of appealing to the unique groups of alumni Widener serves and what ways they have maximized communication to encourage participation from alumni. Relationships are changing in membership associations. Elizabeth Weaver Engel, an association veteran and current head of Spark Consulting, challenges the idea of what membership can mean. This week, Beth and Elizabeth discuss how to re-focus attention, services and potentially business models on what a member needs from their association rather than the other way around. In this session, Beth speaks with Stephanie Cory, executive director of the Epilepsy Foundation of Delaware. Beth and Stephanie discuss new ways to attract volunteers through social media sites you are likely already using and how to really define participation. Where is participation most important? Find out the answer to this question and much more. Learn to tell stories like a professional filmmaker as Beth chats with Hollywood veteran and author of Nonprofit Storytelling for Board Members, Christopher Davenport in this week’s session. He talks about how his experiences making documentaries can help your nonprofit use video to its fullest potential and ensure you reach your target audience—after you learn who exactly that audience is. Storytelling is about connecting with emotion. You don't need to hit all the bullet points. You just don't. That's all internal stuff. Beth chats with Pamela Grow from Simple Development Systems and the Grow Report in a session packed with tips and resources for stripping away the stats and getting to the heart of your story. Kicking off a 3-part series on why stories work, Beth and Vanessa Chase from the Storytelling Non-Profit talk about building emotional buy-in to what's happening. Vanessa shares how story structure builds context for the facts and figures...and much more. When you’re facing a challenge, why not set one? 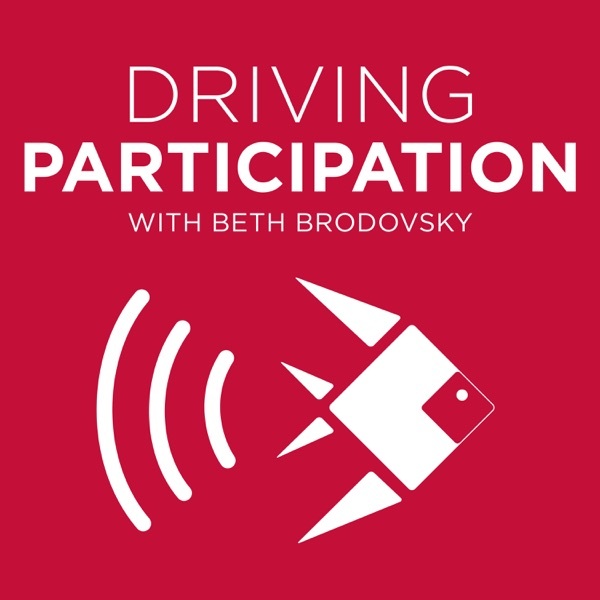 As the kick-off to the Driving Participation Podcast, Beth speaks to Heather Potts Brown, the Executive Director of Annual Giving at Villanova University. Heather shares the strategy that led to a major leap in alumni giving, and why participation from current students and alumni is important for more than just the money.